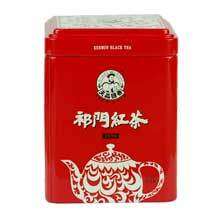 Made using first grade Keemun tea leaves, 1979 Keemun Black Tea makes a wonderful gift for Keemun tea lovers. 1979 is the year when Deng Xiao Peng (one of China's most powerful leader in the 1970s) visited Qing Men and said “Ni Men Qi Men She Jie You Ming", which translates to "Your Keemun is renowed throughout the world". This tea was made to commemorate this event. It is certified organic by BCS (ÖKO- GARANTIE). The fragrance of Keemun is called Qi Men Xiang in China (meaning the sweet fragrance of Keemun) and is characterized by its wonderfully harmonious combination of Orchid and fruity aroma. The taste is strong with a hint of flowery sweetness and a lingering aftertaste. This tea is good for multiple infusion. Tiny tightly curled black tea leaves. The size of the tea leaves are even.